In it, she explored Spanish businesses’ and professionals’ attitudes towards content in 2013, to be able to put the national situation in context with surveys carried out in other international markets. The survey results are based on answers from 70 sources, more or less evenly split between self-employed respondents and B2B and B2C businesses throughout Spain. The answers were gathered anonymously between 17 October and 13 November 2013. What were the results that stood out? These are some of the main conclusions that Eva highlighted. Around a quarter (23%) of respondents have been regularly publishing content for less than 6 months. Just over 1 in 10 (14%) don’t have a corporate website at all. One third (30%) don’t have a defined content strategy, or they used to and have since dropped it. Selling is the least important aim when publishing content, while generating traffic is the most important. Almost half the respondents plan to achieve their objectives across the long term. Content reach is the most-used way of measuring objectives. A third (33%) of respondents are quite or very satisfied with the results achieved. The easiest thing to do when working with content is promote themselves. One in 10 (10%) only publish their own content. The majority of content (both own and recommended) published is informative. The four channels used to distribute content are, firstly, websites and Twitter and, secondly, email and Facebook. The majority of the businesses that took part have fewer than three people dedicated to content. Content and budget – is it a chicken-and-egg question? There are also a couple of additional results that I find very interesting. Over a third (37%) don’t allocate a single Euro of their budget to content. Just under half (47%) are neither happy nor unhappy with the results obtained by their content (just 6% were very happy). Those who allocate the most budget to content also have the greatest trust in content, as well as a content strategy (or similar). About a third (36%) outsource a content-related task, with nearly half (44%) of this group outsourcing content editing/copywriting. I’ve highlighted these few points because I think they illustrate how important it is to invest in a content strategy and quality web content in order to get the results you’re looking for. It’s perhaps a chicken-and-egg question: which comes first, the trust in content or paying for it? I can understand that companies may not want to spend money on content if they are not sure it will help achieve their objectives. But then, if they look for content for free, they are almost certain to set themselves (or the website, newsletter or so on) up to fail. Experience and understanding come at (a very reasonable) price. And, after all, value isn’t judged in Euros alone. In addition, consistency across the long term is key to achieving results. As many of the respondents (76%) have only been working with content for less than 3 years, they may still only now begin to reap the benefits of their investment. 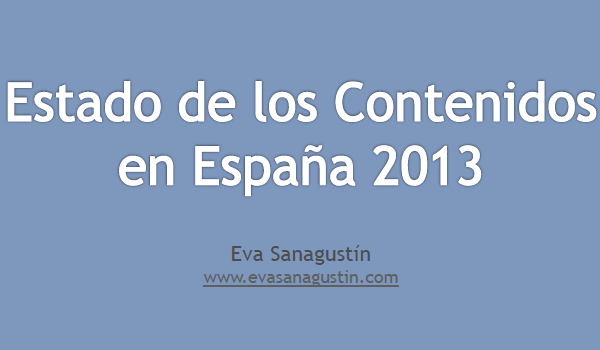 Go to Eva’s website to download the ebook with the full results (Spanish only). You can also follow Eva on Twitter for more content insights (again, Spanish only).